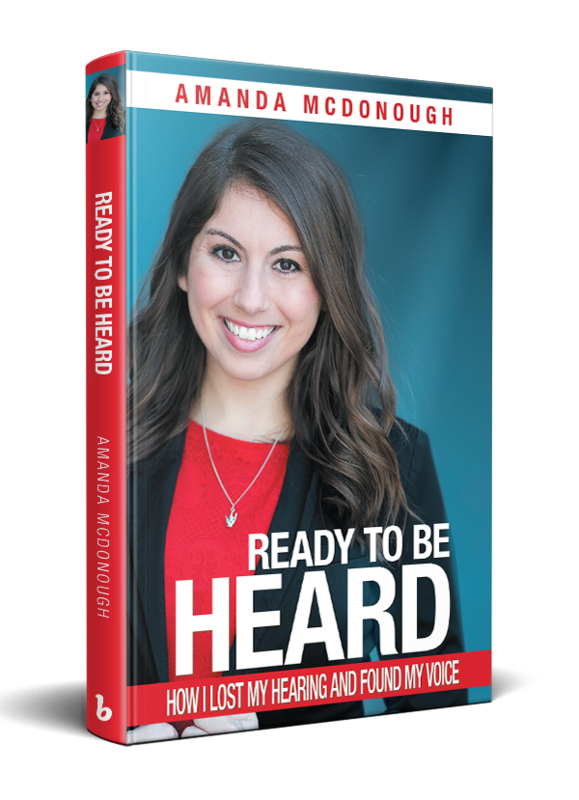 “Ready to Be Heard” is the story of Amanda McDonough, who was diagnosed with hearing loss at the age of 4. As she grew older, her hearing steadily declined as she battled to hide her ongoing hearing loss from her family, friends, teachers, and the world. Despite facing unbelievable challenges, she succeeded in; getting straight A’s in school, having a successful child acting career, and leading a fairly “normal” life. But one day, during the most difficult part of her college career, she awoke to discover that her remaining hearing was completely gone. She had lost 100% of her hearing in both ears. All of a sudden, she was unable to communicate with the people around her. She did not know sign language, could no longer speak well, and could not lip read. She became isolated from the world and had to finally face her hearing loss, accept that she was deaf, and find a way to finish college without being able to hear. She found the strength to teach herself to talk well again, to lip-read, and to use sign language. As she was learning new communication skills, she also graduated from college and set out on an emotional rollercoaster ride to discover who she was and who she wanted to become. Join her on her journey to find a balance between the hearing world she was raised in and the Deaf culture she now belonged to. This is a story about overcoming obstacles, finding yourself, and making your mark on the world. “Ready To Be Heard” is a story for all ages written to give you an inside look at what life is like for someone growing up with deteriorating hearing loss and it is a unique look into Deaf culture from the point of view of a late Deafened adult. For anyone looking for inspiration to help with a challenging life situation or condition, Amanda's story will provide encouragement and will help you make your voice heard. ​To Keep Updated on Events and Learn More Tips and Tricks About Hearing loss Sign Up For Our Newsletter!